Arriving in America in the 1970’s I was introduced to a few American Chinese restaurants that still served chop suey and chow mein. I remembered that one particular item on the menu aroused my curiosity. It was Moo Goo Gai Pan. Expecting a dish with mushrooms and chicken I ordered it. Imagine my horror when the dish arrived displaying a rainbow array of vegetables with pork slices. There was no Moo Goo. There was no Gai Pan. 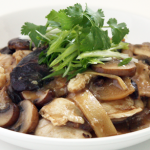 The name “Moo Goo Gai Pan” is a Cantonese phonetic translation for Stir-fried Chicken with Mushrooms. 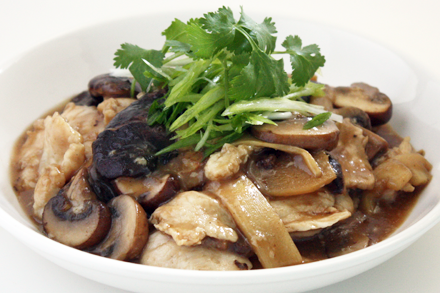 Moo Goo (蘑菇), or Mo Gu in Mandarin, refers to mushrooms, and Gai Pan (雞片), or Ji Pian in Mandarin, means sliced chicken. 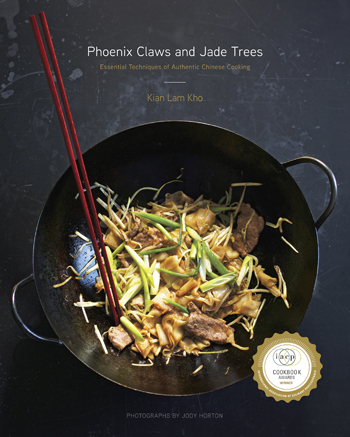 Combined the characters refer to any stir-fry dish that contains mushrooms and sliced chicken. There seems to be no definitive record of when the name was first used but its simplicity very much suggests that the dish was probably of humble origin. It’s most likely the dish was popularized from being listed in the menus of American Chinese restaurants. Sadly Moo Goo Gai Pan has become a generic term for any stir-fry with psychedelic color ingredients. Often shrimp, pork or other proteins substitute for the chicken. Mushrooms are regularly omitted in favor of snow peas, green and red peppers, water chestnuts, baby corns and other colorful vegetables. I don’t object to creating innovative combinations of ingredients to make a stir-fry dish, but don’t call it Moo Goo Gai Pan. It’s like making a soup of beef with kale and calling it clam chowder. I would even respect a recipe that included sliced chicken with snow peas and red peppers along with mushrooms. At least it contains the basic ingredients with other flourishes. For me I interpret the dish literally as simply a stir-fry with chicken and mushrooms. 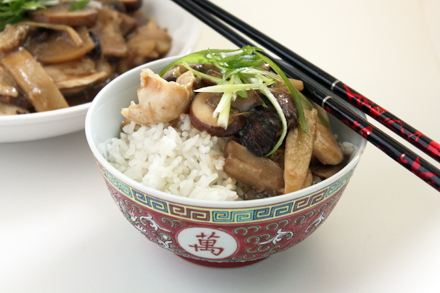 Although in my recipe I decided to add bamboo shoots for extra crunchiness, and I use two types of mushrooms — crimini and shiitake — to infuse extra flavors. Moo Goo Gai Pan is a dish that uses the moist stir-fry technique, which results in a slightly thickened sauce. To complement this sauce the chicken is coated with an egg white and starch mixture then shallow fried in a pool of oil before being drained thoroughly and used for stir-frying. This process, known as “velveting” results in tender chicken covered with a silky smooth coating. If you like a colorful stir-fry then go ahead, take this basic recipe and add snow peas, thinly sliced carrots, red or green peppers or any other non-leafy vegetable. But keep the sliced chicken and the mushrooms intact. You won’t be ridiculed for misinterpreting the name of the dish. Cut the chicken breasts against the grain into thin slices of about 1/8 inch thick. 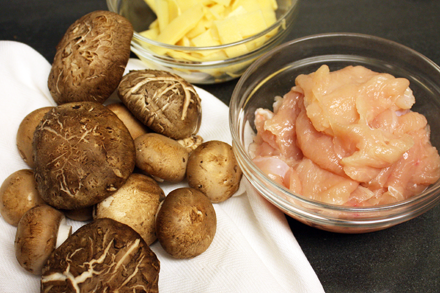 Place the chicken slices in a bowl and mix in all the velveting ingredients. Set aside. Cut both the crimini and shiitake mushrooms into slices of about 1/4 inch thick. Set aside. Cut the bamboo shoots into thin slices of about 1/8 inch thick and set aside. Also cut the garlic and ginger into very thin slices of about 1/16 inch thick. In another bowl mix all the sauce ingredients together and set aside. Heat all the vegetable oil in a wok until just about reaching the smoking point. Drop the chicken slices into the hot oil and stir to keep them separate. Cook to about 3/4 done or until the outside of the chicken turns white but the center is still slightly pink. Drain the chicken thoroughly and set aside in a bowl. Pour all the oil out of the wok and quickly rinse the bottom of the wok with plain water scraping off any starch that’s stuck to the bottom. Dry the wok and return to the heat. Put about 1 tablespoon of vegetable oil back into the wok. Add the garlic and ginger slices and stir-fry for about one minute without letting them burn. 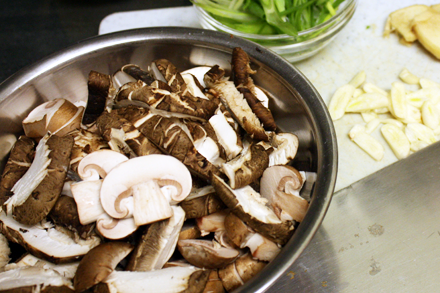 Add the mushrooms and the chicken stock into the wok. Stir-fry for about 30 seconds cover and let sit for another one minute. Uncover the wok and return the chicken slices to the wok. Add the bamboo shoots and stir-fry for another 30 seconds. Add the sauce mixture into the wok. Be sure to stir the mixture to ensure the starch is completely combined. Stir-fry until the sauce thickens. Add the sesame oil and mix well. Plate and garnish with scallion slices and cilantro. HA! Ok, that comparison to Beef Stew and Clam Chowder made me laugh out loud. Thanks for the great recipe! Teehee. OK, an explanation! I had no idea what “Moo Goo Gai Pan” was supposed to be, as I don’t think I’ve ever seen it on menus here. The words sound made up! But, I’ve heard it watching TV shows/movies. I second Aunt LoLo re the Beef Soup-Clam Chowder comparison. LOL. I’m showing my age admitting to ordering Moo Goo Gai Pan in a restaurant. It was a long time ago when it was served in a restaurant. I don’t think I’ve ever had moo goo gai pan at a Chinese restaurant in the US. I know I ate a lot of chicken and mushroom dishes in China that were really good (and probably easier to cook than I thought). I always wondered what this dish was.. your article and pictures are fabulous! What a lovely website, a real serendipity! Most of the Chinese restaurants in New Orleans serve Moo Goo Gai Pan. It is always chicken and mushrooms with colorful veggies added. I was raised in Ohio and as soon as I graduated college, I headed for San Francisco. I will never forget the stern lecture I received from a Chinese waiter at a Chinatown restaurant when I asked for Moo Goo Gai Pan….why wasn’t it on the menu? He said that there was no such Chinese dish…it was an American dish and it is not served anywhere in Chinatown. That was just one of a zillion things I learned in the Liberal, Progressive, Tolerant, Beautiful, Friendly, city of San Francisco….a place where a bit of my heart and soul still resides. Now I’m back in Dumfukistan (the former state of Ohio) and recently went to a Chinese restaurant. And there was Moo Goo Gai Pan. I should have known then to get up and leave, but I saw Mushu Pork on the menu and remembered how I loved it. I was brought 3 wonton wrappers wrapped in plastic wrap straight from the microwave with a plate of shredded slop and a tiny plastic container of the worst plum sauce imaginable. The owner and I ended up in a fight at the register when he asked how I liked the meal. Don’t ask questions you don’t want the answers to. Possibly, it was the worst meal ever (a close contender to the Xmas Day Buffet at The Great Western Hotel). Dim Sum….I so miss Dim Sum. After so many years of good living and dining in San Francisco, there is no point in even going out to eat in Ohio. My taste buds have been spoiled beyond rehabilitation. I now must cook….if only I could afford a decent kitchen with some space and great ventilation, it wouldn’t be so bad. Won ton wrappers instead of crepes????? At first I was in shock. I thought it was a wrapped-up towel with which to clean my hands. Then I just howled at the ignorance around me. Then I just wanted to cry knowing I was stuck here for the immediate future. I have a crepe maker somewhere…maybe I’ll whip some up someday and freeze a number of them. Thanks for listening to my Moo Goo Gai Pan rant….which must have been better than the Mushu Pork. Dear PKF, Don’t despair. Learn to cook Chinese. You can often mail order ingredients from San Francisco or New York. Learn the techniques I describe in Red Cook. Then you can adapt local ingredients into many of the recipes on Red Cook. I cooked Chinese food when I was in college. Then after moving to San Francisco, there was no need to cook….just hopped on a cable car and headed to Chinatown. I’ll have to get my wok out and start again. If you could see my tiny kitchen and my little 20″ stove with its poor little hood, you would understand my despair. Alas, I think I will barter with a friend with a good kitchen. I’ll use her/his stove and provide her/him with an excellent meal. Can you suggest what would be good Chinese dishes that can be frozen? When I cook, I like to prepare several single serving meals that can be frozen. I would suggest anything that is braised can be great for freezing. Look for red cooked beef recipe on the site. Dumplings are great for freezing as well. Freeze them in one layer on a tray first to prevent them from sticking to each other. Once frozen you can collect them and put them in bags. Fried rice and soups are excellent for freezing as well. Stir-fried dishes unfortunately are not suitable for freezing. I hope this helps. Sorry to necro-post, but thought it might be helpful. If you have limited kitchen space, consider getting an electric skillet. I have a Presto 16″ one that, even though we have a decent kitchen and nice stove, I use for about 3/4 of meals. They take up little space, have good heat control, and can be used for frying, braising, sauteeing, and anything you would cook in a deep dish or shallow pan. I just made extremely good Moo Goo Gai Pan in mine, and cleanup was like two minutes. Also, if you get lousy food at a restaurant, unless it is bad enough that you send it back without continuing to eat it, you are still obligated to pay for it, unless the management decides otherwise. If it’s bad enough not to pay for, you should not eat it. If a manager asks how your food was, and it sucked, tell them as politely but firmly as you can manage. Don’t pick a fight or make a scene – it just makes you look like a huge jerk, even if it makes the other person look like one also. If you just make a scene, they’ll think you’re just a fussy, obnoxious customer (so would I! ), and won’t fix anything. If you act calm and reasonable, you have a chance to make a difference. If the manager flips their wig, then _they’ll_ be the one at fault. If I get crappy food and service, I vote with my feet, and I use services like Yelp or Google Reviews to indicate what my experience was like, so other people can save their money for good restaurants. Of course, I much prefer those times when I can give a restaurant a good review, and I think those are ultimately more important. In any case, best wishes and happy eating. You speak the truth, man. Sadly, many Chinese restaurants in the Midwest of America still serve chop suey, chow mein and “Moo Goo Gai pan”. It’s practically impossible to find a good Chinese restaurant in Ohio…..or a Mexican one, for that matter. San Francisco spoiled me and my taste buds forever. Thanks for understanding the plight of an Ohioan. This is true. I remember a friend telling me that tacos are not supposed to have sour cream in them, and that amazed me because I’ve only found once place that serves it sans the cream. Why is it that California and New York have advanced in Chinese food, but the Midwest has not? I suspect, strange as it may seem, that the quality of Chinese food in a region might be at least partly dependent on the size of the Jewish population. My Jewish friends and neighbors seemed almost to make a cultural thing out of Chinese food. Places I’ve lived that have no delis or crappy delis, also tend to have crappy Chinese food. It’s been some years, but some of the best Chinese food I’ve had in my life, with the possible exception of Great Wall in Broomfield, Colorado, and Heaven Dragon in Thornton, was in South Florida. In fact, I never had any _bad_ Chinese food in South Florida. I tried this today because I have been wanting to make this American Chinese restaurant favorite for a while, but wanted to try it in a more Chinese version. I chose this recipe because of the large amount of rice wine in the sauce. It was very delicious. Definitely will make it again.